Multi-Car Collision Avoidance Project (MuCCA) is a complex, collaborative R&D project that can benefit greatly from a systems engineering approach, says Thomas Levermore, a Systems Engineer at the Transport Systems Catapult (TSC). The MuCCA project will develop a next-generation driver aid that aims to avoid multi-car collisions on motorways – if an accident cannot be avoided, the MuCCA system will attempt to minimise its consequences (both injuries and damage). This is a complex project by any definition, and by applying systems engineering methods, we can introduce technological innovation into the planning and development stages. The starting point of the systems engineering process is pulling together the requirements of the stakeholders. The MuCCA project brings together six partners, each contributing to the common goal of reducing the number and severity of multi-car collisions. However, with partners coming from academia, small, medium and large companies, each has a different approach and existing technical systems to incorporate. Before all the partners begin to develop their parts of the MuCCA system, systems engineering ensures everyone takes a step back, looks at the system as a whole in order to understand its purpose and where their elements of the system fit with others. As a systems engineering team at TSC we provide neutral guidance to the system design to balance each partners’ objectives and ensure the system meets the needs of future users. By developing an operational concept for the system, all the assumptions and constraints can be documented and a definition of what the system will (and importantly won’t) do can be agreed upon. To reach an agreement on the scope of the MuCCA prototype system, use cases were developed along with the operational concept to describe situations in which the system is to intervene. These use cases were described by the approximate relative starting positions and speeds of the cars involved. Examples are two side-by-side cars avoiding a crashed vehicle, and a car avoiding a crash ahead which is partially obscured by the car in front. > From this foundation, requirements were discussed with the consortium to detail what the system is required to do so that it can achieve the objectives of the project. > With an operational concept and an initial set of requirements, the v-model process followed in this project leads to development of the system architecture. 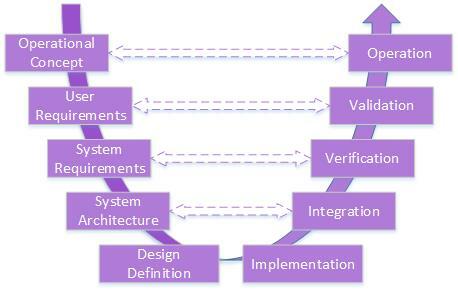 A cornerstone of any successful systems engineering process is a well-defined system architecture. At the mention of system architecture, it is common to imagine a diagram of how physical pieces of equipment fit together. Often when existing components are available to be used in a system, there is a tendency to work backwards from what is available to dictate what the functionality of the system can be, resulting in a limited system. Going straight to the physical architecture misses a vital step in the process. Taking a step back and looking at the functionality needed to satisfy the requirements allows a functional architecture to be developed without pre-supposing the physical architecture. Once the initial functional architecture is developed, a mapping of functional elements to physical elements ensures that the physical architecture supports the required functionality. 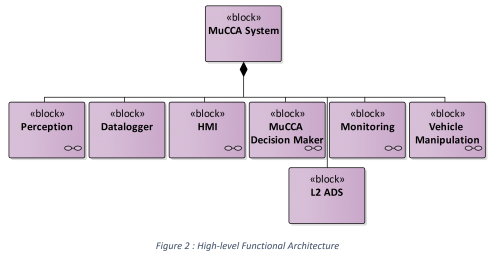 An initial high level functional architecture for MuCCA was developed based on a reference architecture presented in A Functional Reference Architecture for Autonomous Driving. In a complex, collaborative project that combines software, electrical and mechanical engineering it is vital to define the functional architecture. The re-use of existing components has many benefits for the project partners but the functional to physical mapping will identify if such components are suitable for the new system. A number of studies have shown there is material benefit to investing time and effort in systems engineering. A comprehensive study of 148 projects completed in 2012 at Carnegie Mellon University showed that only 15% of the projects which had dedicated the least effort to systems engineering achieved high project performance, while 57% of those deploying the most effort achieved high project performance. In the subset of projects defined as highly challenging, the gap was even wider. Given the challenges of six organisations coming together to build an autonomous, collaborative collision avoidance system, the MuCCA project demonstrates how a solid systems engineering foundation will help lead to great project outcomes. The MuCCA project team invested significant effort in systems engineering during the early stages of the project, and ensuring this process continues throughout the lifetime of the project is essential. The most recent milestone in the systems engineering process has been approval by the consortium of the system architecture, and the next challenge will be following requirements through the design phase being led by IDIADA, to ensure that they will be met and can be verified as such. Thinking of the project as a whole (and indeed any other complex R&D project), a systems engineering approach clearly pays dividends. By looking at the problem from multiple angles, bringing multi-disciplinary teams together, and taking the time to really understand what every partner brings to – and how they sit within – the project, you are helping to ensure its success from both the partners’ and the stakeholders’ perspective. Good projects have good systems, and the MuCCA project and partners are benefitting from this one, which will ultimately lead to smarter vehicles and safer roads for all.